He joined the Observer Research Foundation (ORF) to initiate and subsequently head a Eurasian Studies Programme (2004). Prior to becoming an academic, he was a journalist for almost 25 years. The bulk of his career was with India’s premier news agency The Press Trust of India (PTI). He left PTI after a 3-year stint as its Chief of Bureau in Moscow in the early 90s. Subsequently, he moved into news management with India’s first news channel Television International (TVI). 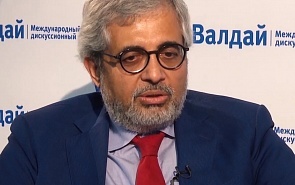 Nandan Unnikrishnan is one of India’s leading experts on the former Soviet space, particularly India-Russia relations. His articles are widely published in and outside India. He has also edited and co-authored several books and monographs. However successful the defence relationship between India and Russia, it is not enough in the modern world to sustain a truly strategic partnership – one that provides each other with greater strategic space to deal with the challenges of the new emerging geopolitical world order. ﻿Iran's joining of the SCO is beneficial to both sides, said Valdai Club expert, Nandan Unnikrishnan, Vice President and Senior Fellow at the Observer Research Foundation. With the accession of Iran, the SCO will be able to settle the Afghanistan problem, and develop strategic transport corridors. Iran, becoming a member of the SCO, will raise its rating as a regional player. The most complicated issue in the current standoff between the Indian and Chinese military in the Doklam region is negotiating a solution in which neither side appears to have lost, Valdai Club expert Nandan Unnikrishnan, Vice President and Senior Fellow at the Observer Research Foundation, believes. Tensions between Washington and Moscow and the deepening embrace between China and Russia are of concern to India. Moscow should know that PM Modi sees India is an independent actor on the world stage. Russia clearly has a pragmatic leadership which would not want to jeopardise a multi-billion dollar relationship with India for a few million dollars' deals with Pakistan. The Russian-Pakistani military cooperation is a relatively new phenomenon.